Spring is here and the weather is finally feeling like it should here in the South! Please remember that we will have NO SCHOOL next week due to Spring Break. It's a busy time of year here at OPES and we hope you will take a few minutes to review several upcoming activities and see what your students have been learning in classroom guidance! Also, 5th grade parents, please see the special announcement for you at the very end of the newsletter! As always, if you have any questions, please feel free to contact us at any time! Snacks - We're always looking for extra snacks for our students who may not have access to them. Donations can be dropped off at the front office! Just let the office staff know you're dropping them off for the guidance department! Remember, no peanut products! 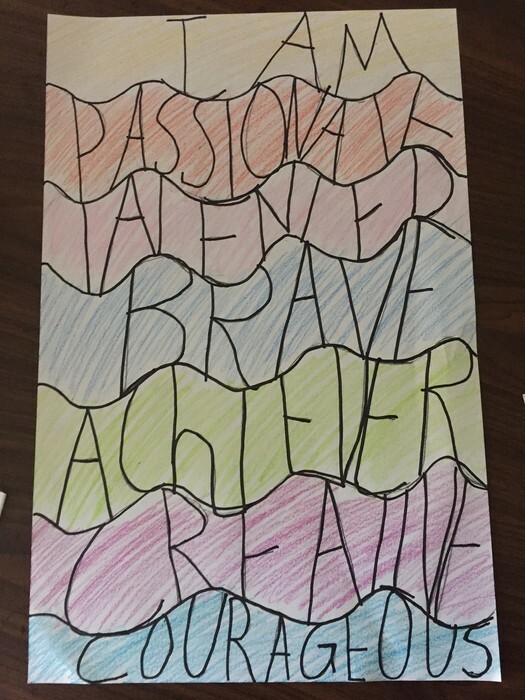 All grade levels spent time learning about what it means to do your personal best and how this relates to how we feel about ourselves! 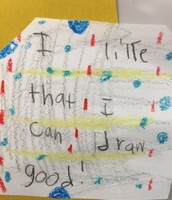 Kindergarten - The students learned about doing their best even when things get tough! We read, The Little Engine That Could to see how we should believe in ourselves and strive to reach our goals. 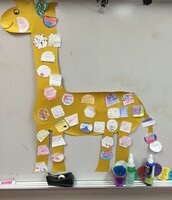 1st Grade - We read the book "Giraffes Can't Dance" by Giles Andreae and discussed how Gerald the giraffe felt about himself and the fact that he couldn't dance as well as the other animals in the jungle. 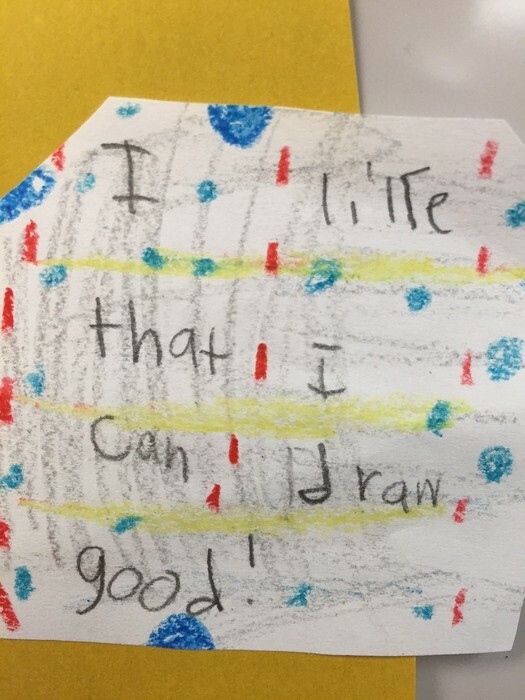 Students learned that when you believe in yourself and think about all that you can do well, you will perform your best no matter what the challenge is! 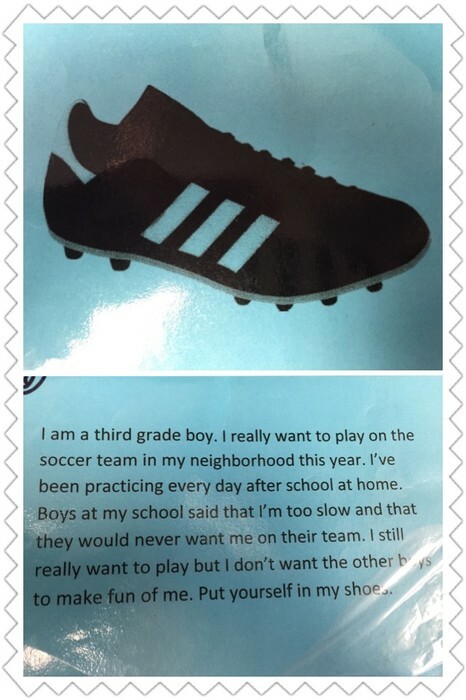 2nd Grade - The students learned about how we must work hard when things get tough. We learned that we must persevere! As a class we discussed how we can reach our school, family, and friendship goals! We read the story, A Chair for My Mother to see how a family persevered to reach their goals. 3rd Grade - We spent some time reviewing what self-esteem means and the things that can affect how we feel about ourselves. We completed our movie study on "McKenna Shoots for the Stars" and had a great discussion on the challenges we face that can impact how we feel about ourselves from day to day. 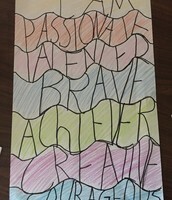 4th Grade - The students learned about the importance of doing your personal best to reach your goals. The students were instructed to rate their effort on a scale of 1 to 5. 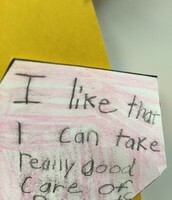 Based on their personal ratings, the students set new goals to help them do well at school and become better sons/daughters and great friends! 5th Grade - We continued our unit on getting to know ourselves and took a "self-esteem" inventory to determine how we felt about ourselves. 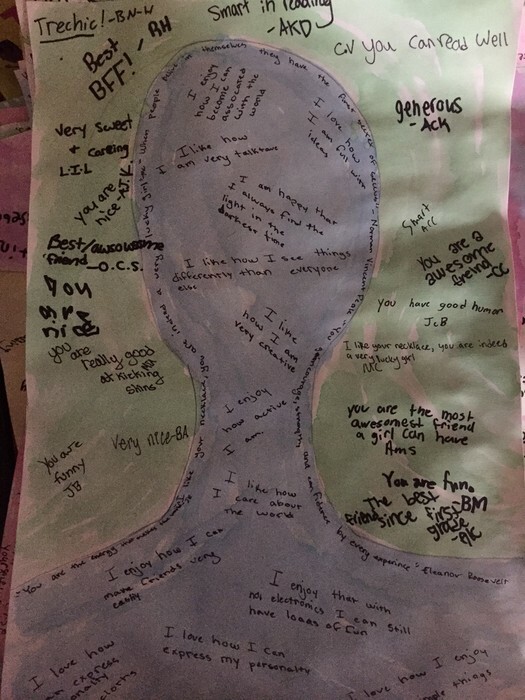 This was a very thoughtful activity for the students and they really enjoyed thinking of all of the things that we face on a daily basis that can have an impact on how we feel about ourselves from day to day. We used movie clips to study situational factors that can have a short-term or long-term affect on our self-esteem. We spent the entire week discussing kindness and ways to be kind to ourselves and others during our Random Acts of Kindness Week (RAK Week). Kindergarten - We learned that we should be kind at home and at school! We read, The Kindness Quilt to get some ideas of how to be kind! The students came up with a list of ways to show kindness. 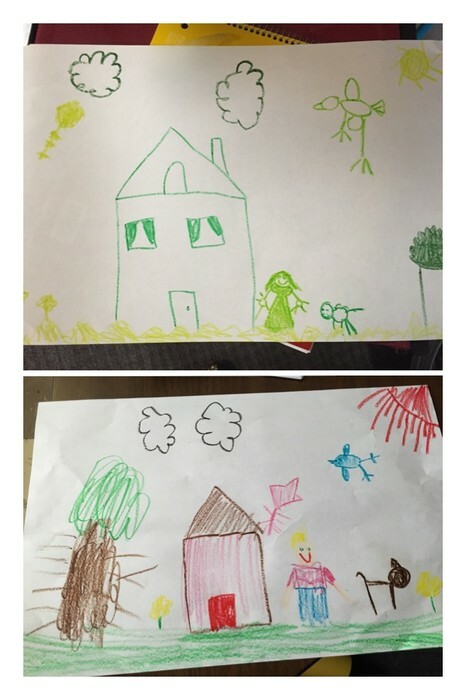 They also drew a picture of them doing their kind acts! 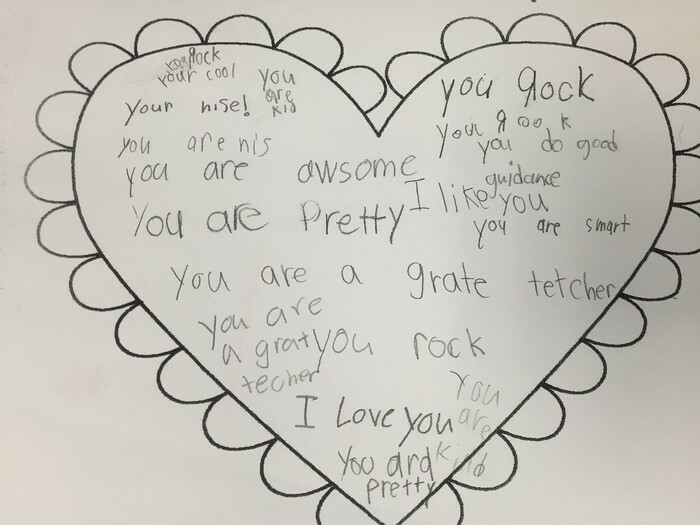 2nd Grade - In order to spread kindness, second graders had the pleasure of writing thank you cards to teachers and staff members at OPES! They also thanked our awesome PTO members! They learned that they can make a difference in our school by being kind to others! 3rd Grade - We spent some time reviewing what self-esteem means and the things that can affect how we feel about ourselves. We learned the importance of being kind to ourselves and taking the time to think about the things that make us who we are. We then created "I AM" murals as a visual way to represent who we are. (see below for example). 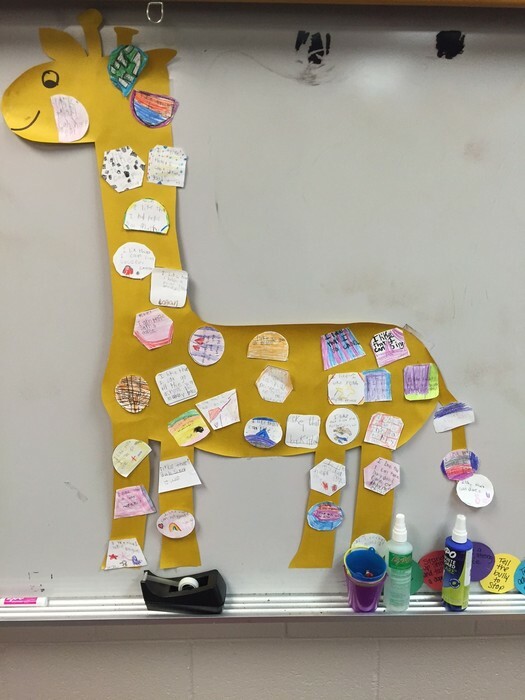 4th Grade - During Random Acts of Kindness Week, the 4th graders learned about the importance of spreading kindness. They had the pleasure of creating Get Well cards for the patients at The Levine Children’s Hospital! The students did a great job and their messages were very heartfelt! 5th Grade - We discussed the term "compliment" and took some time think about how we can show kindness to others with compliments. We began an art project to showcase the things that make us who we are (as an extension to our self-esteem lesson)! 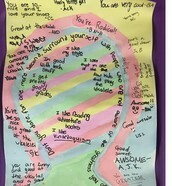 Students completed Part 1 of the activity which included students giving each other compliments. All grade levels participated in activities that show us how our differences are what makes the world interesting and that we need to respect each other for who we are! Kindergarten - We read, The Crayon Box That Talked to learn how we must appreciate the great qualities of others. 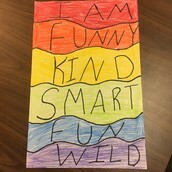 The students shared what makes them unique and we also created a classroom crayon box to highlight our personalities! The students also learned about having good manners at school and at home! 1st Grade - We drew a classroom picture using Ms. Sanders' "one of a kind" crayon box! 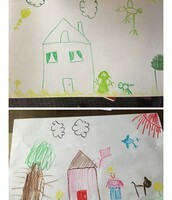 Volunteers took turns choosing a crayon from the box and completing part of our picture. Volunteers were told to keep what was in the box a secret until the very end! Once we finished the drawing students made comments about the picture...."Why was the picture only drawn in green? ", "Why did our friends only choose green crayons to color with? ", "Why are the clouds green? "....We revealed that the crayon box ONLY had green crayons in it so that was the only choice that our friends had to choose from! How boring to only be able to choose one color! We then related this to what it would be like if everyone in the world was only one color, or only talked on way, or wore the same clothes and liked only the same things! Students agreed that this would be very boring and they would not like it! We learned that people are a lot like a crayon box and that we need all the colors and all types of different people to make the world interesting. To illustrate this, students were able to work in groups to re-create our class drawing using a crayon box full of colors this time! 2nd Grade- The students learned about having tolerance. We practiced accepting everyone's differences by playing the "compliment game". We also read, Odd Velvet. This story taught us that we must get to know people and appreciate them for who they are! We learned that we should not judge others by their outward appearance. We know that a person's character is their most important quality! 3rd Grade - We introduced the terms "diversity", "tolerance" and "empathy" and watched the Dr. Seuss video "The Sneetches". We discussed how silly it was that the sneetches excluded each other because some had stars and some didn't! They even went so far as to try to change their appearance to either "fit-in" or "stand-out" from each other. In the end, the sneetches learned that they had a lot more in common that they thought and it didn't really matter who had stars and who didn't! To illustrate this, we took a class survey and graphed the things that were similar and different about our class. Students saw that while we had some things that were very different from each other, we also had a lot of things that were very similar! Students all agreed that it was ridiculous to exclude someone from a group just because they are different in some way that you are. 4th Grade - The students learned about the importance of having tolerance. We viewed several pictures that lead our discussion as we learned about tolerance and diversity. We also played a game that highlighted the diversity in each classroom. The students learned that although we have many similarities, we also have differences that make us special. This lesson taught us that we should appreciate the differences of others, and our own qualities that make us unique as well! 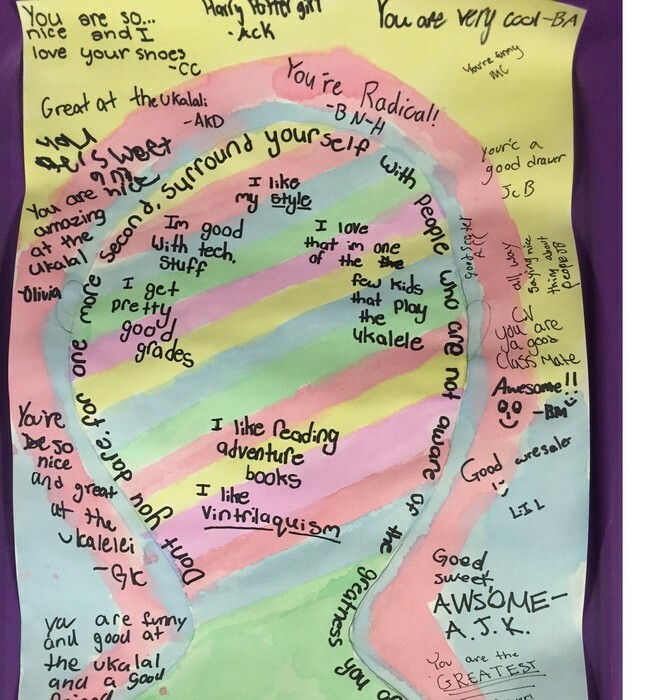 5th Grade - We completed our art project and took some time to decorate and review the compliments that we had received and the things that we like about ourselves and that we do well. We pointed our that no ones mural was the exact same and that we liked each classmate for a different reason. It's good to have a group of people that have different interest and abilities because we can all contribute to the group in some way. Kindergarten -The students learned about how to determine how a friend is feeling. We learned that we will know how our family members and friends feel if we pay attention to their facial expressions and body language. The students also learned about the Zones of Regulation (Self-control). We learned that we must control our strong emotions in order to learn and make others feel comfortable around us! 1st Grade - We read "The Berenstein Bears and Trouble with Friends" by Shel Silverstein and discussed what it takes to be a good friend. We learned the term "characteristics" and discussed the characteristics that we would and would not want in a friend. 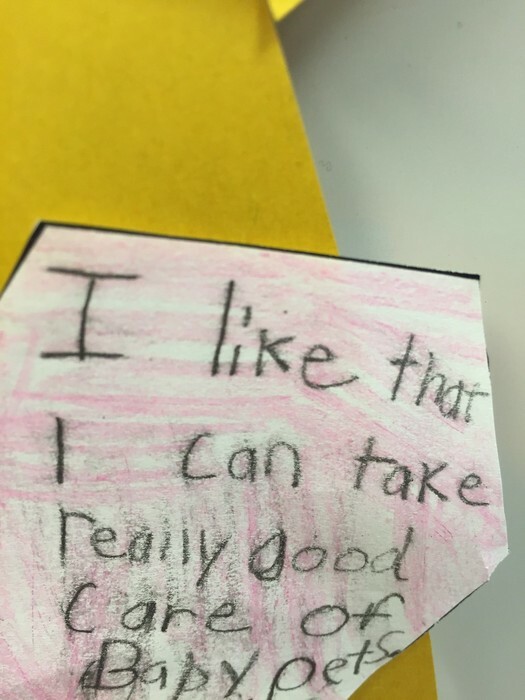 Students then had the opportunity to create their very own "friendship recipe" with all of the things that they would want in a friend. 2nd Grade - We learned about the character traits that we should seek in a friend. We read the book, Enemy Pie and learned that we should get to know a person's character before we judge them. The students also learned about ways to resolve their conflicts. We practiced using various methods such as talking about the problem, walking away, and choosing another game. The students also learned how to use "I" Messages; a great way to solve problems by speaking from your heart! 3rd Grade - We reviewed the term "empathy" and read the book "Stand in My Shoes" by Bob Sornson. 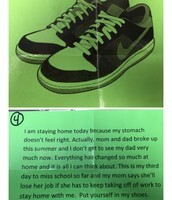 Students were then given scenario cards with a pair of shoes and a story about the person that wears those shoes. Students were challenged to "stand in" that person's shoes and think about: 1. How does this person feel, 2. How would we feel if we were this person?, 3. What do we think this person wants to happen?. 4. What would we want to happen? and 5. What could we do or say to help the situation? Students really enjoyed this activity and gave some great insight into how others may feel. 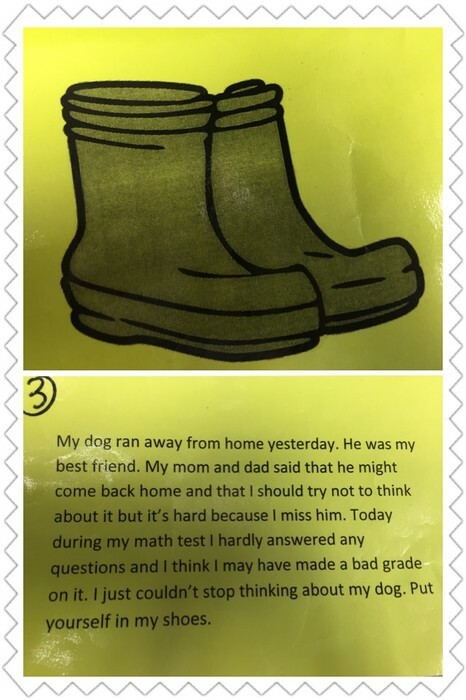 Students then had the opportunity to write about what a day in their shoes would be like (what would they do, who would they see, where would they go, how would they feel). 4th Grade -The students have learned about the exceptional qualities we should seek in a friend. 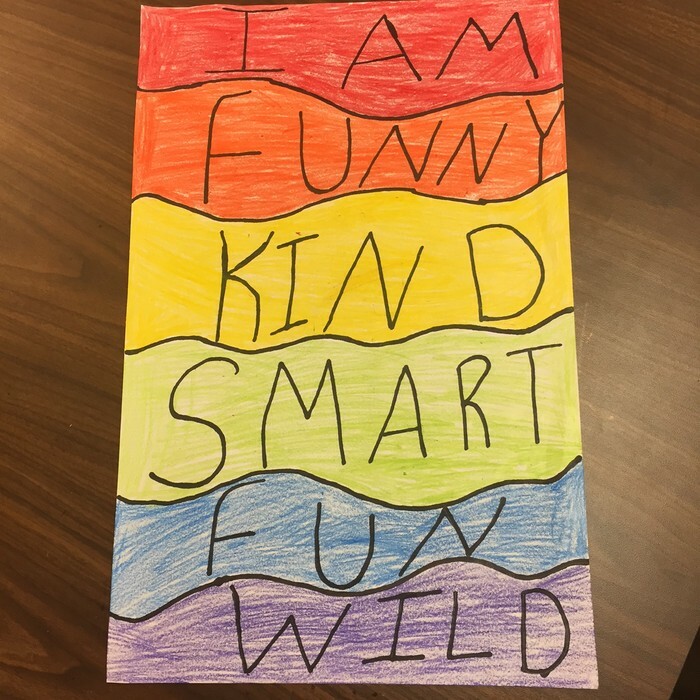 The students created "Friendship Wanted Posters" to highlight qualities such as: respectful, loyal, trustworthy, and many others. We also learned about the effects of rumors and gossip. We read the story, Trouble Talk to see how rumors can impact others in a negative way. 5th Grade - We discussed the terms "empathy", "sympathy" and "apathy" and talked about how each term relates to how we interact with others when they look like they may need some help. 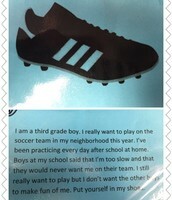 Students were then given scenario cards with a pair of shoes and a story about the person that wears those shoes. 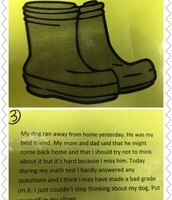 Students were challenged to "stand in" that person's shoes and think about: 1. How does this person feel, 2. How would we feel if we were this person?, 3. What do we think this person wants to happen?. 4. What would we want to happen? and 5. What could we do or say to help the situation? 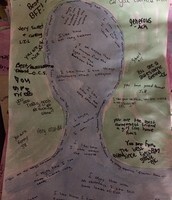 Students really enjoyed this activity and gave some great insight into how others may feel. 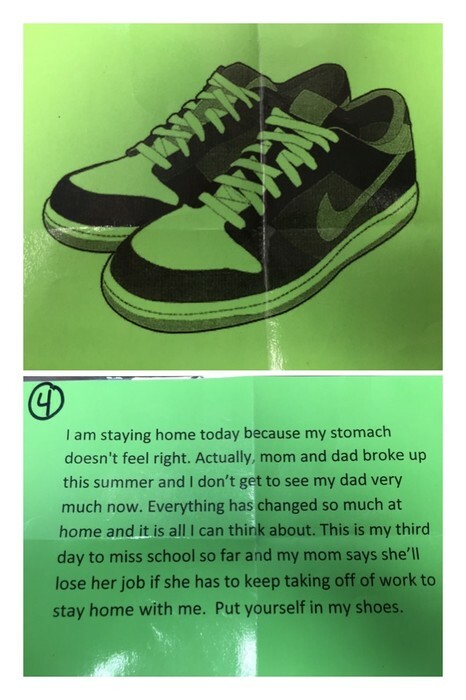 Students then had the opportunity to write about what a day in their shoes would be like (what would they do, who would they see, where would they go, how would they feel). When we return from spring break, you will be receiving an envelope with a parent survey and instructions on how to complete the survey. This is your opportunity to provide feedback on OPES and the Fort Mill School District. Please be on the look out for this! Also, students in 5th grade will soon be preparing for middle school! Students will have the opportunity to ask any questions they have about middle school and will also get the opportunity to visit Banks Trail on Friday, May 22nd. I'm sure some parents have just as many questions about middle school as the students do! Please use the below link to ask any questions you have about middle school! We'll compile a list of questions and answers (for parents) and send those out before the end of the school year! Refer a student to the school counselor. Referrals are confidential and are only view-able by the school counselors.